Next month I go to speak at the Oscar Wilde conference “Wilde on the Borders” at Niagara University in Niagara Falls, N.Y. Whenever I travel to give a talk on Wilde, especially to places such as in New York City, Brooklyn, or Philadelphia, where Wilde also lectured, I always feel that I am following in his footsteps. After all, we share the same mission: that of promoting Oscar Wilde. 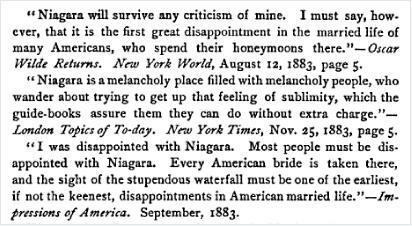 It is the now the turn of Niagara Falls, and, although Wilde did not speak publicly there (he lectured in nearby in Buffalo, New York), he did take a sojourn from his tour to visit Niagara and play tourist for a couple of days. The reason for needing a rest was that Wilde’s lecture in Buffalo, New York on February 8th, 1882, was his twelfth lecture of the tour overall, but his seventh in nine days, and he was beginning to weary of the travel. Fortunately for Wilde, the Buffalo lecture was a rare matinee, and there was time for him to take a much needed break with a visit to the Falls. So he courteously declined social invitations for the evening, and boarded the 6:10 PM train over the Central Railroad to Niagara, some twenty miles to the north of Buffalo. Today there are twin cities of Niagara Falls. The other is in Ontario on the Canadian side . 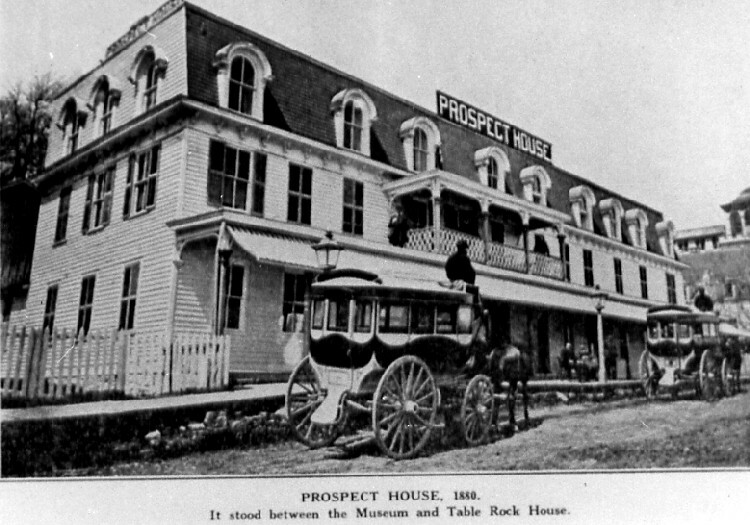 This is the one Wilde visited and he put up at Prospect House  here pictured in 1880. Since Wilde’s arrival in New York for his tour of America, much had been made in the press of his remark that he was disappointed in the Atlantic Ocean. Now at Niagara Falls, Wilde was confronted by another majestic embodiment of the natural world, and was again moved to apparent meiosis. Reports telegraphed back to New York from Ontario probably trailed off after Wilde’s salvo of continued disappointment with all things North American, and the press seized upon the opportunity for more ridicule. The satirical magazine “Fun”, March 8, 1882. It should be noted, as a general rule, that contemporary observers failed to see Wilde’s avant garde penchant for abandoning the truth for the sake of an epigram, or to sympathize with his deliberately arch sensitivity to natural beauty. However, Wilde played up to press myopia, quickly learning what he immortalized years later, that there is only one thing worse than being talked about and that is not being talked about. In preparation for following in Oscar’s footsteps to Niagara Falls next month I decided to see if it could be done literally. 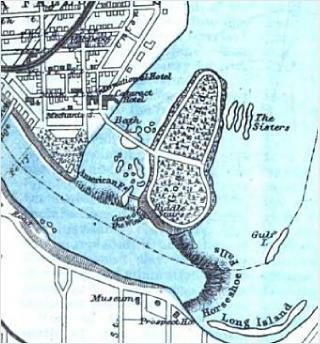 Comparing this old map (below) with Google Street View, I have calculated that it is possible to stand in the same spot at Prospect House where Oscar leaned over to view the Falls. No doubt I shall be misty-eyed. But if I can recapture firsthand a similar Wildean stream of consciousness I shall report next time on the ratio of beauty to disappointment. on the Canadian side is marked at the foot of the map. Buffalo Express, February 9th, 1882. The City of Niagara Falls, NY was incorporated on March 17, 1892 from the villages of Manchester and Suspension Bridge, which were parts of the Town of Niagara in the southwest corner of the county, a settlement originally founded in 1812 as the “Town of Schlosser”. 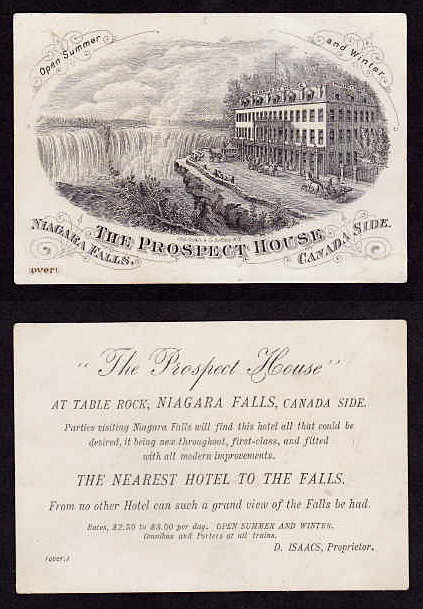 There were other hotels known as Prospect House in the area before and after this one, the name presumably popular because of the view afforded of the Falls from the now collapsed plateau of Table Rock. Probably not said by Da Vinci any more than Wilde’s assertion of that Dante inaugurated the saying “painting the town red”. More on Wilde anon. JC. Buffalo Express, February 10th, 1882. Sometimes there is no better opportunity for an exact perspective on the past, then from same footprint! I look forward to your posting that follows. Also – I liked Wilde’s framing – observance of line, form and color in his artistic description of the falls.